We’d love your help. Let us know what’s wrong with this preview of Easy Bake Coven by J.D. Shaw. To ask other readers questions about Easy Bake Coven, please sign up. What a great book! Very well written and a true page-turner! The author created a wonderful world and fantastic characters. this book is so refreshing! a great new plot "outside the box" the author has an amazing mind that looks at things just a little differntly. cannot wait for the rest of the series to unfold! Cute fun read. Great for summer! Love the references to the Finger Lake Region of NY. This was a really fun weekend read. A little more morbid than I expected but, for me, that is a good thing indeed. The romance here was very sweet, but it felt a little rushed to me at some point. Like they were both very comfortable being in love right away. It just didn't ring very true to me. The characters were g This was a really fun weekend read. A little more morbid than I expected but, for me, that is a good thing indeed. When I first started this book, I wasn't sure about it. The mix of mystery, witches, werewolves and the undead is something I've never read before, but I was going to try it. As it turns out, I got totally engrossed in it and didn't even realize I had read the whole thing. The characters are great. The plot was one that drew me in and didn't let me go until the very end. Now I can't wait for the next one to come out. OMG..........this was REALLY bad. Some of the food sounded good, but other than that, stay far away from this one. Poorly written and characters that I couldn't possibly have cared any less about. Mediocre mystery. Thanks J.D. Hope to return to Cayuga Cove soon. Vivienne Finch has her dreams set on opening ‘Sweet Dreams Bakery’ in her little seaside town. But when the mayor’s wife ends up dead in her dumpster on opening day, the tiny town is pushed onto its side, and Vivienne is dragged right along with it. Right up front I will say I liked the book. The plot was interesting, and the twists did keep coming with the who-dun-it part of this book. The town was well described too. The author was good to detail how the little main street looked, especially si Vivienne Finch has her dreams set on opening ‘Sweet Dreams Bakery’ in her little seaside town. But when the mayor’s wife ends up dead in her dumpster on opening day, the tiny town is pushed onto its side, and Vivienne is dragged right along with it. Right up front I will say I liked the book. The plot was interesting, and the twists did keep coming with the who-dun-it part of this book. The town was well described too. The author was good to detail how the little main street looked, especially since the mayor’s wife had been planning to give main street a face lift to better attract more tourists, and the characters were fairly engaging to read and follow. I definitely look forward to book two come the winter season. However, there’s a reason why it doesn’t have a higher rating. For all the good, there were some issues that I had with the book too. Between the synopsis posted and the title, you knew that it would have something to do with witches in the story. I just didn’t realize that it would be so far into the story. I feel like, as a whole the title was kind of a let down, because Vivienne doesn’t find out she’s a witch until a good part of the book, and really? There is no coven. It’s a vague, hand wavy reference through her grandmother and then at the very end of the book. As well, I think that things were taken far too well, far too sugary sweet toothed. Things that any normal person would freak out about finding out, especially when it comes to try and kill you, Vivienne just absorbed and kept on walking like it was a normal day in her tiny Cove town. In that respect, the character fell a little flat and two-dimensional to me, because it’s not JUST the witch part that she takes with just a bat of her eyes, but secrets about other supernaturals as well. I wish she would have freaked out, thrown a fit, something to show that this was completely out of her norm and out of the reality she’d lived in for all of her life. The female psyche was not achieved. First person would have been better approach. Cute yet predictable. Typos grammar. The biggest tip the women's psyche was not captured was she said "I love you" too fast and all the women in the book were cliche. An enjoyable fluffy read with slightly 2-dimensional characters. Every October, I love to read books that help put me in the mood for my favorite holiday - Halloween! Looking online for books this year, I was immediately interested in Easy Bake Coven by J.D. Shaw - the synopsis teased magic and mystery... and baked goods! I knew I'd found my book for October. Easy Bake Coven picks up a few days before Vivienne Finch plans to open Sweet Dreams Bakery in Cayuga Cove, a small town in upstate New York. She's in the final stages of launching her business when her m Every October, I love to read books that help put me in the mood for my favorite holiday - Halloween! Looking online for books this year, I was immediately interested in Easy Bake Coven by J.D. Shaw - the synopsis teased magic and mystery... and baked goods! I knew I'd found my book for October. 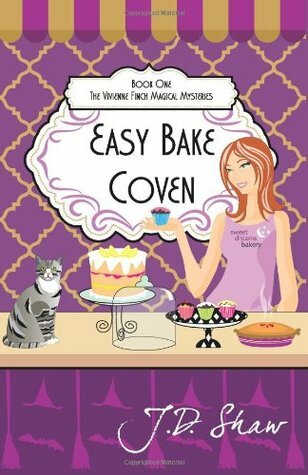 Easy Bake Coven picks up a few days before Vivienne Finch plans to open Sweet Dreams Bakery in Cayuga Cove, a small town in upstate New York. She's in the final stages of launching her business when her mother sets her up on a blind date with Joshua Arkins, the new sheriff's deputy. Everything seems to be going well until the morning of Vivienne's big opening when the mayor's wife, Mona Clarke, is found dead in the dumpster behind her building, stabbed with the ceremonial ribbon cutting scissors. Vivienne begins to investigate the murder, slowly exposing the complicated world of secrets and lies that lie just beneath Cayuga Cove's sleepy exterior. To further complicate matters, Vivienne's grandmother reveals to her that she's a witch, having inherited the magical abilities that skip every other generation, putting Vivienne squarely in the sights of a dangerous enemy. 1 star... This book was bad, so bad I may have given up and skipped to the end. I will avoid this author like the plague in the future. 2 stars... This book was not very good, and I won't be reading any more from the author. 3 stars... This book was ok, but I won't go out of my way to read more, But if I find another book by the author for under a dollar I'd pick it up. 4 stars... I really enjoyed this book and will definitely be on the look out to pick up more from the series/author. I just finished the first book in this series, which is new to me. Have found it terrific. Only thing missing was a recipe for her famous cake. The plot set in a small town community was very realistic, and the personalities were well drawn . The interplay of two different branches, so to speak, of witchcraft was intriguing. Small town squabbles turned into big time crime. I highly recommend this book , and there are more and the series. Short light read during holidays. This could have used some proof reading. The bakery sounds like a nice little shop, but might be hard to keep open while Vivienne is learning witchcraft and running around solving mysteries and murders. Nicely written and kept me interested from first to last page. Can't wait to read the next book in the series. A fun book. Well done easy read ~ baking, mystery, witches, werewolf - what more is needed for escapist, relaxing read. I enjoyed this book. It was a light read and I really liked the characters. I am not sure if I will continue the series but everything she made sure sounds delicious. Was good mystery. Kept you guessing who dunnit. Probably will not continue with this series. A cozy paranormal mystery/romance, which tries to be all things to all people and partly succeeds. J.D. Shaw has always been drawn to the creative arts and all things spooky, even as a young child. Good grades eluded him in art class because no matter what the subject, he would always add a skeleton, pumpkin, witch, or bat into the mix. Why? Because he loved Halloween more than any other holiday and his mother has the picture of him at four years old kissing his carved pumpkin goodnight to prov J.D. Shaw has always been drawn to the creative arts and all things spooky, even as a young child. Good grades eluded him in art class because no matter what the subject, he would always add a skeleton, pumpkin, witch, or bat into the mix. Why? Because he loved Halloween more than any other holiday and his mother has the picture of him at four years old kissing his carved pumpkin goodnight to prove it! After high school, he attended community college for a business management program, but dropped out several weeks later when he found the drama club. He devoured every theatre and literature course the school offered, making Dean's list several times. But, it was a creative writing course that changed his fate. It was there, in a small classroom with about twenty students, where he finally figured out what it was he wanted to do. He was going to write books. Books with spooky things in them. Upon his acceptance into the Odyssey Writing Workshop run by Jeanne Cavelos in the summer of 2008, he spent six weeks with the best authors and professionals in the business. He learned the art of how to tell not just a story, but a great story. He learned that the cozy mystery genre was his strength. A few years after the program, he had finally crafted his mystery series idea. The Vivienne Finch Magical Mysteries is the result of this hard work and he couldn't be more proud of the result. He lives in Elmira, NY and is hard at work on the next book in the series.